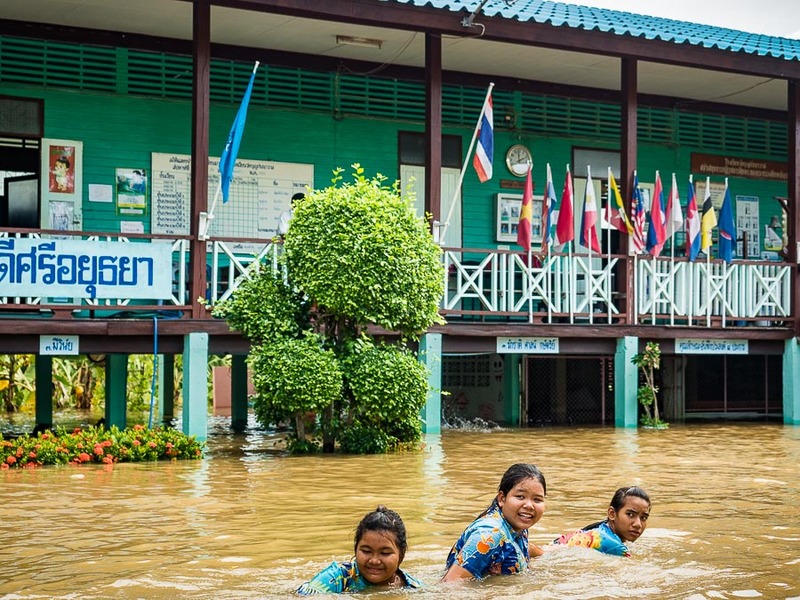 Thai school girls play and swim in the flood waters that have inundated the playground of their school in Ayutthaya province north of Bangkok. 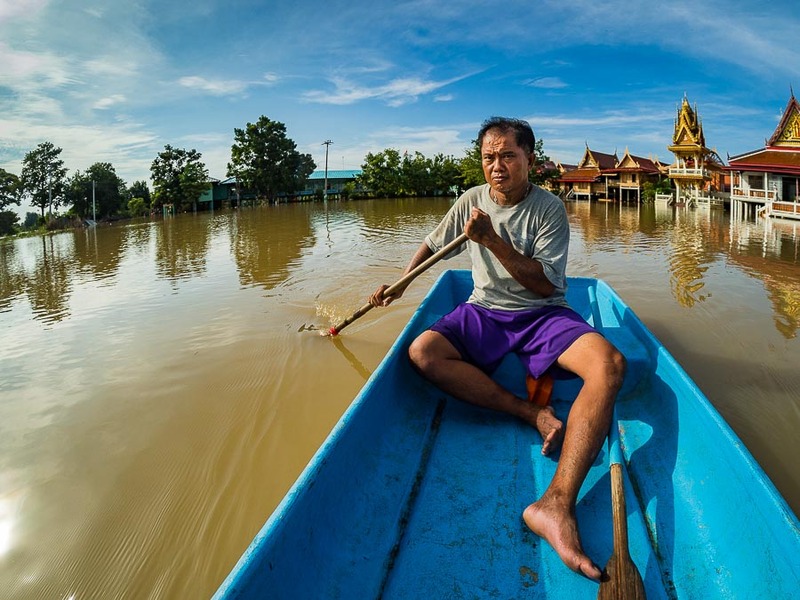 Two months ago I was covering the drought that devastated rural Thailand and most of Cambodia. I think it's a little early to say the drought is over, but it has been raining. In some places it's raining a lot and the drought is certainly abating. Now I'm covering floods in central Thailand. 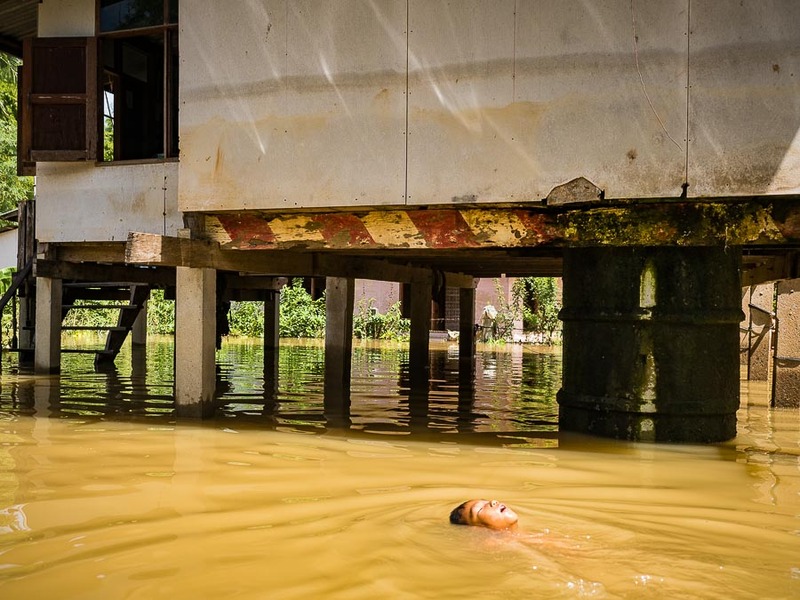 A child swims in the flood waters that swept through his village. 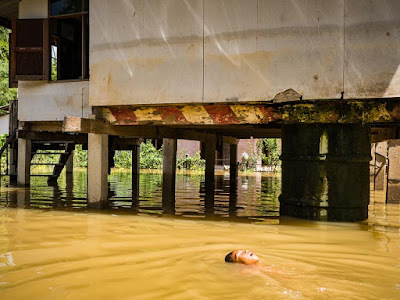 Flood waters along the Chao Phraya River recently swept down river and pushed through communities along the river. This flood is not caused by too much rain. Indeed, the Thai government says reservoirs upstream are still below 50% full. The current round of flooding was triggered when officials in flood mitigation and irrigation departments opened sluices and flood gates along the river to make room in the reservoirs for expected heavy rains in October. And statues at the temple are submerged. 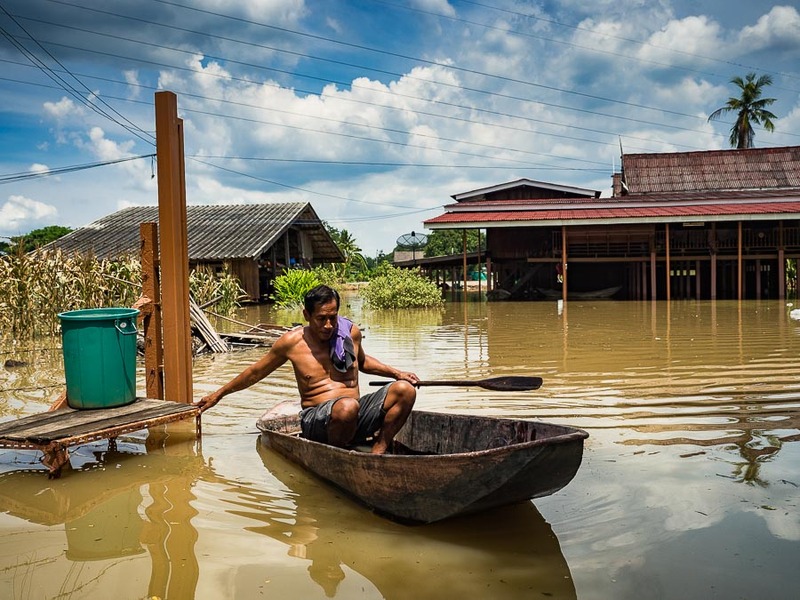 In 2011, Thailand was devastated by historically bad flooding that swamped 65 of the country's 77 provinces. 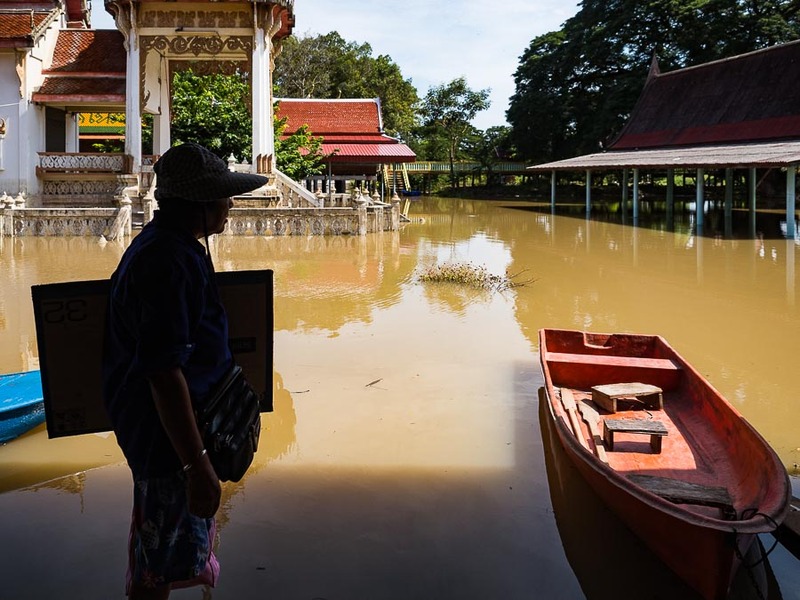 Localized flooding started in July, by October huge swaths of central Thailand (including the parts of Ayutthaya that are again underwater) were submerged, the flood wasn't declared over until January 2012. I wasn't living here during the 2011 flood, but I followed it from our home in Phoenix and did what I could do get wire service coverage of the flood into the Arizona Republic. People living in the US probably best remember the flood because it took Western Digital's hard drive factories in Thailand off line and, at the time, most of the WD drives sold in the US were made in Thailand. A lottery vendor waits in the flooded plaza of a temple for a boat to take to her home in a flooded village a few hundred meters away. Thailand was so traumatized by the 2011 flood that the current government has vowed it will never again happen and that everything that can be done will be done to prevent a recurrence. So with the prediction of more rains in October, the sluices are being opened to make room in the reservoirs. A woman lifts her daughter out of a boat. This is not a waterway. It's a road. A banana plantation, now underwater, is on the left. 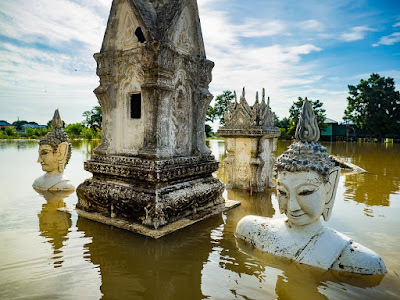 I went up to Ayutthaya today to see how bad the flooding is. The local people I talked to said this was the worst flooding they've seen since 2011. A number of communities are underwater and thousands acres of farmland are underwater. 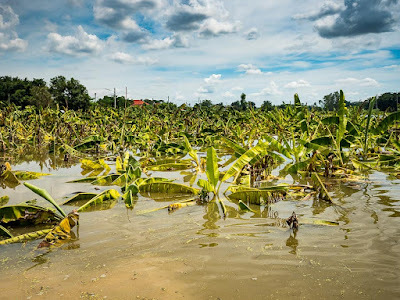 In the district I was in, most of the flooded farmland had been banana plantations but rice fields have flooded in other parts of Ayutthaya. The areas that are flooded are really flooded. 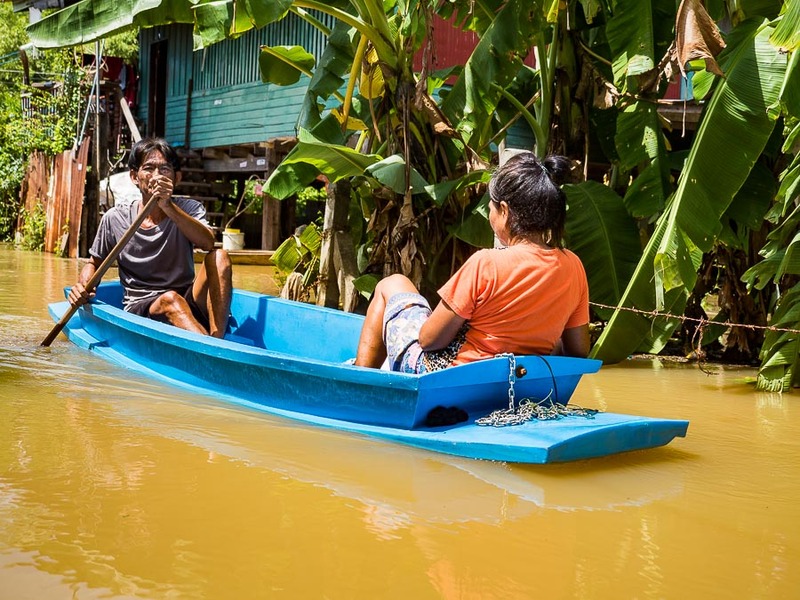 Some villages have more than a meter of water flowing through them. At this point though the flooding is still localized. Some areas are completely submerged but neighboring villages are bone dry. Many of the roads here are built well above grade and they function (intentionally) as dikes or levees and the dikes are saving communities away from the river. 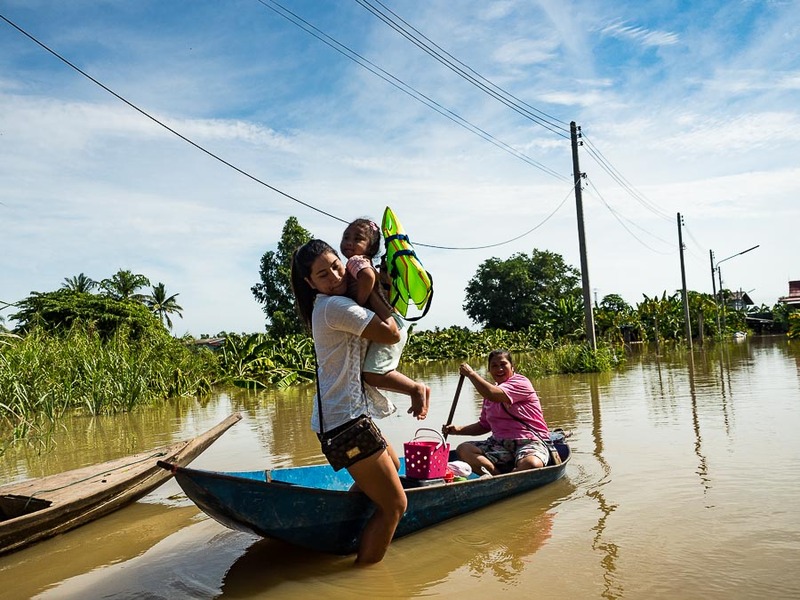 Villagers paddle down a flooded road in their village. The water here was about a meter deep. The government has asked the flooded communities to be patient and has asked dry communities to do what they can to help their neighbors. Even though this flood is still localized, communities that are flooded are experiencing significant losses. I met a banana and corn farmer who lost his entire year's crops. Both his cornfields and banana groves are completely underwater. His loss is 100%. A man who grows corn and bananas paddles out to the road that runs past his now flooded farm. His submerged banana groves. 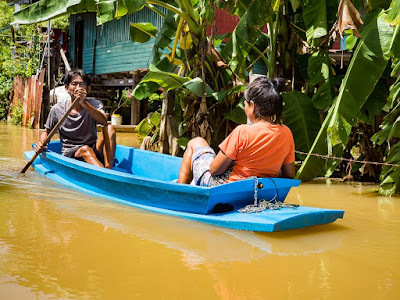 The water here is very deep - the banana plants are well over two meters tall. This is early in the flood season and flood waters are still inching up. This isn't a flood like Katrina in 2005 or the Fukishima tsunami in 2011 - cataclysmic events that swept through a community in hours. This is a disaster in slow motion. 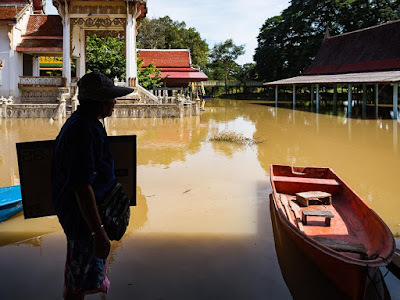 A person at a flooded temple told me everyday there is more water in the temple, that the flood started a week ago and it's still getting worse. A man pulls a "khlong" jar back to his home in a flooded village. 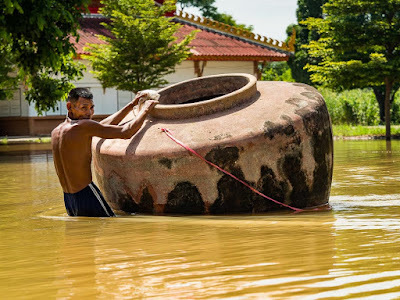 In rural Thailand these huge ceramic jars are used to store domestic water. His broke loose overnight and he pulled back to his home. The people I met in Ayutthaya are responding to the flood with what I could only call Thai je ne sais quoi. When I wanted to visit a flooded village, I asked a shopkeeper if there were any boats available. She yelled to a friend that I needed a boat and her friend, an 80 year old woman, paddled over to me and told me to hop in and took me through the village. When we got back to the highway, the woman who paddled me around refused my offer of money. We had a brief discussion and I was finally able to convince her to take about 100 Baht. Less than $3.00 US. 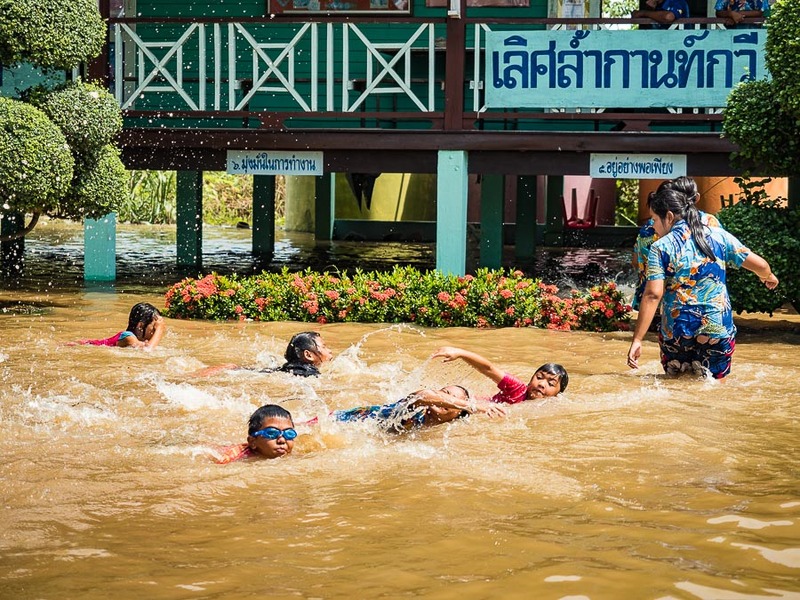 Children swim in the floodwaters that left their playground submerged. I stopped at a school that was partially submerged (the first floor was underwater but the second floor was dry and all of the classes had moved upstairs). I asked if I could look around and the principal said of course and then added, "but you should really come back at 1.30PM, when the children swim in the playground." So I went back at 1.30 and the students were taking swimming lessons in the floodwaters. The banana farmer who lost everything invited me into an empty storage shed and offered me his last bunch of bananas. I tried to pay for the bananas and he absolutely refused. He wouldn't accept anything from me. 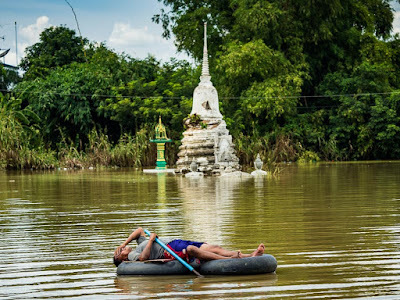 A man from a flooded village floats on a home made raft past a submerged chedi and Buddha statues at a temple in Bang Ban. There are more photos of the flooding in my archive or available from ZUMA Press.